Every term the foundation (church appointed) governors at Seal School produce a prayer letter for the school, with various prayer requests for that term’s activities. You can find this term's prayer letter here. THANK YOU to all who walked, cycled or welcomed visitors as part of the Historic Churches Bike and Hike yesterday. 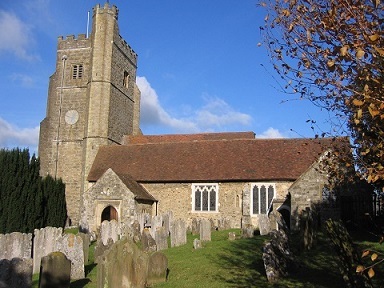 Congratulations to all our walkers and cyclists, and especially to our youth group, who visited most of the churches in central Sevenoaks before making their way home (rather wearily!). We had some fascinating theological discussions along the way, and managed to get everyone home safely, without causing too many breaches of the peace along the way! The young people also (surreptitiously) rated all the churches we visited on general attractiveness, warmth of welcome and standard of refreshments - the last probably outweighed the others!- and I'm glad to say that Seal still came top for them! Our special thanks go to Nicky Harvey who organised this for us again, made refreshments and walked with the Youth Group. Today's ordination of Deacons in the Cathedral was a wonderful, joyful service. Our new Curate, Stephen Snelling, of course, was one of the ordinands, and, from the beaming smile on his face, clearly found the service every bit as moving as those of us who were watching. Here are some photos - a "before" and "after" shot. In case you wonder what a Deacon is, I have pasted below the words which are read in ordination services just before the candidates are ordained. "Deacons are called to work with the Bishop and the priests with whom they serve as heralds of Christ’s kingdom. They are to proclaim the gospel in word and deed, as agents of God’s purposes of love. They are to serve the community in which they are set, bringing to the Church the needs and hopes of all the people. They are to work with their fellow members in searching out the poor and weak, the sick and lonely and those who are oppressed and powerless, reaching into the forgotten corners of the world, that the love of God may be made visible. Deacons are to seek nourishment from the Scriptures; they are to study them with God’s people, that the whole Church may be equipped to live out the gospel in the world. They are to be faithful in prayer, expectant and watchful for the signs of God’s presence, as he reveals his kingdom among us." In practical terms a deacon can lead worship, preach, take part in the pastoral work, and do many of the other things a priest does, but deacons can't pronounce the absolution or the blessing, or consecrate the bread and wine at Holy Communion. Clergy are normally ordained deacon first, then ordained priest a year later, so Stephen should be ordained as a priest this time next year. You can recognise a deacon by the fact that they wear their stoles diagonally across one shoulder,- Miss World style! - rather than vertically as priests do. We will be welcoming Stephen officially at Seal tomorrow morning for his first service with us. Please pray for him and for his wife, Deborah, as they begin this new stage in their lives.